I’ve come out of hiding to let you all know about (what looks to be) an amazing special by Dianne Sawyer and ABC News. My first day at APTN! I landed in Winnipeg early this morning, about 10 hours after I was supposed to thanks to issues with United Airlines [groan]. As you may have seen in my tweets yesterday, United was canceling, rescheduling and even booting people off of flights left and right! One flight was supposed to seat 50 passengers, but the gate agents made an announcement saying they could only take 22! So, as you can imagine, I was happy to have finally touched down in Canada, though it was the next day and I had only had 3hrs of sleep the night before! Because I didn’t have as much time as I would have liked (none at all, actually), to check out the town and figure out the bus route to my internship, I called a cab. 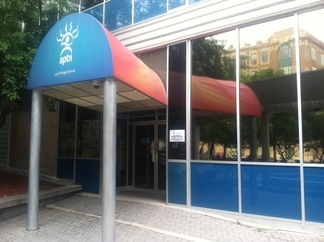 $20CAN later and I arrived at the Aboriginal Peoples Television Network office in downtown Winnipeg. NABJ Journalist of the Year and CNN Anchor and Special Correspondent, Soledad O’Brien, offers advice on how to be a successful journalist to CUNY Graduate School of Journalism students. Who better to offer advice to incoming and returning J-School students than Soledad O’Brien? As a CNN Anchor and Special Correspondent, as well as a reporter for the CNN ‘In America’ unit, O’Brien has reported on the Black, Latino, and gay experience in America. Maria de la Soledad Teresa O’Brien who is a member of the National Association of Hispanic Journalists and the National Association of Black Journalists was raised by an Afro-Cuban mother and an Australian father of Irish and Scottish heritage and is the fifth of six children, all of whom graduated from Harvard University. She grew up on the affluent North Shore in the community of St. James on Long Island, New York. Now, a Manhattan resident, she is raising four children with her husband, Bradley Raymond who is an investment banker whom she met at Harvard. Ground-breaking work indeed. The second installment of the ‘Black in America’ series, for which O’Brien was primarily being honored, was CNN’s most-watched documentary series of 2009. In it, O’Brien explores the way in which people have gotten involved in their communities to make a significant impact and improve the Black American experience. Later that year CNN premiered ‘Latino in America’ which, in a similar vein, delves into the diverse experiences and obstacles facing the Latino community as well as the impact Latinos have on America. Speaking about her award further, O’Brien says, “I hope it’s an honor that’s at the beginning of my career and not an end of career kind of honor.” I am most certain this is among many accolades O’Brien will receive for her work. We will be seeing much more of O’Brien this year when her upcoming CNN specials ‘New Orleans Rising’ and ‘Black in America: Churched’ air on August 21 and October 14, respectively. Anderson Cooper is my hero. PORT AU PRINCE, HAITI – I’ve taken a break from blogging while I work on my graduate school applications. I am just about done (finally!) and I plan to be back very soon! I wasn’t planning on posting anything until I was ready for my official return, but after seeing the following video I just couldn’t help myself. I love to write and I have missed it over the past couple of months, but the reason I felt so compelled to post a blog was to share this incredible video with you. It is because of journalists like Anderson Cooper that I have chosen to become a journalist. It is because of exceptional stories that need to be shared with the world that I blog. I want to change the world and make a difference in the lives of others. Journalists like Cooper are doing just that. If you’d like a simple reason as to why Anderson Cooper is my hero, please just check out the video below. Sometimes journalists who cover tragedies become numb to violence, suffering, and death and forget that the people they are filming are just that – people – not simply a news story. Anderson Cooper talks about this in his book Dispatches from the Edge : A Memoir of War, Disasters, and Survival. If you have yet to read his novel, I strongly suggest you do. It changed my life (as trite as that may sound). In the video below Cooper shows that he is not just a journalist, but a person – a person who really cares and wants to make a difference…and is. Right now the people of Haiti are suffering and I wish there were some profound way that I could help. I’m afraid all I can do (or have been able to come up with) is to donate to various organizations working to directly help the Haitian people. I wish I were as courageous as Anderson Cooper (and had the honor of working for such an incredible news organization such as CNN!) and could be on the frontlines filming what is going on so that people back at home and around the world will be compelled to do something, too…even if it’s to simply donate money to the Red Cross, for example. Please note that the video below is very disturbing and contains strong violence, but illustrates how badly Haiti needs our support…and that there are some journalists who are not afraid to risk their own lives to help others. I will be keeping the people of Haiti in my thoughts and prayers. I hope you will do the same. Click the photo above to visit AmyStretten.com for more.